346 pages | 9 B/W Illus. Attachment: Expanding the Cultural Connections is an exciting exploration of the latest trends in the theory and application of attachment within cross-cultural settings. 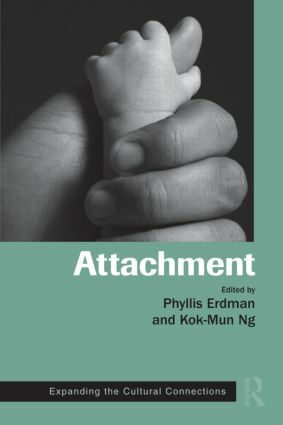 The book's insightful analysis, remarkable case studies, and groundbreaking research make it essential reading for any clinician or scholar interested in perceptions of love and attachment. Part I: Introduction. Metzger, Erdman, Ng, Attachment in Cultural Contexts. Part II: Conceptual Extensions and Measurement Issues. Wang, Song, Adult Attachment Reconceptualized. Imamoğlu, Imamoğlu, Attachment Within a Cultural Perspective. Behrens, Amae through the Eyes of Japanese Mothers. Gassin, Cultural Variations in the Link Between Attachment and Bereavement. Shaver, Mikulincer, Alonso-Arbiol, Lavy, Assessment of Adult Attachment Across Cultures. Karakurt, Kafescioğlu, Keiley, Cross-cultural Adult Attachment Research. Morgenstern, Magai, The Utility of the Adult Attachment Interview in the United States. Part III: Child-caregiver Attachment. Jin, Jacobvitz, Hazen, A Cross-cultural Study of Attachment in Korea and the U.S. Sümer, Kağıtçıbaşı, Culturally Relevant Parenting Predictors of Attachment Security. Tomlinson, Murray, Cooper, Attachment Theory, Culture, and Africa. Part IV: Adult Attachment. Yalçınkaya, Rapoza, Malley-Morrison, Adult Attachment in Cross-cultural and International Research. Schmitt, Romantic Attachment from Argentina to Zimbabwe. Hatfield, Rapson, Culture, Attachment Style, and Romantic Relationships. Johri, Mothering from the Margins. Shi, Adult Attachment Patterns and Their Consequences in Romantic Relationships. Part V: Clinical Applications. Peluso, Miranda, Firpo-Jimenez, Pham, Attachment Dynamics and Latin Cultures. Shi, Contextual Thinking in Attachment. Phyllis Erdman, PhD, is a Professor and Interim Dean in Washington State University’s College of Education. She has published numerous articles on family therapy and is co-editor of Attachment and Family Systems: Conceptual, Empirical, and Therapeutic Relatedness (Routledge, 2003). Kok-Mun Ng, PhD, is an Associate Professor of Counselor Education and Supervision at the University of North Carolina at Charlotte and provides counseling services to individuals, couples, and families. Dr. Ng has authored several professional journal articles and book chapters on couples and family therapy and counselor training.